During the period of the U.S. sailing navy and the early steam-powered navy, nearly all ships possessed small boats, propelled by oars or small sails. These smaller craft permitted the transfer of personnel or small cargoes from ship to shore or ship to ship on the open sea. Like their mother ships, these gigs or small boats carried a stern staff for a small ensign. The small ensigns flown on these gigs were called Boat Flags by the U.S. Navy. When first employed, Boat Flags followed the same pattern and design as the current ensigns of the ship. However, as the number of states increased, so too did the number of stars on both the ensigns and the boat flags. For the large ensigns, this posed little problem; the flags were large enough that the stars were still visible. 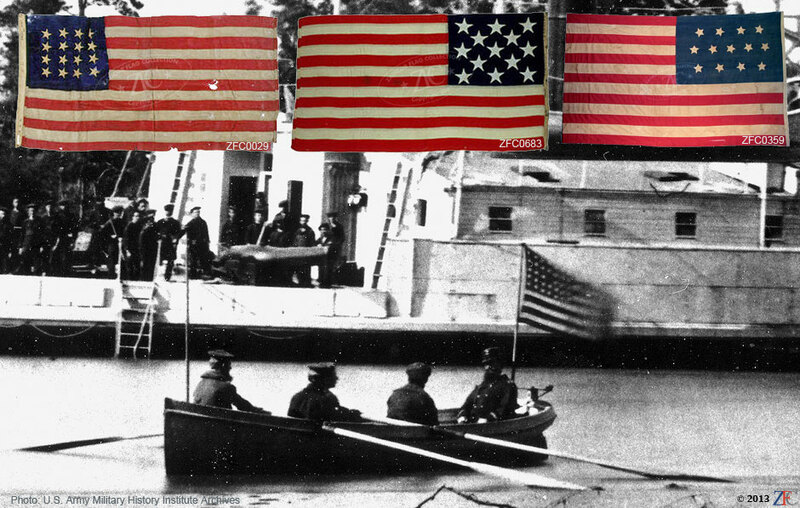 For the small boat flags, however, the corresponding diminishing of the star size as the number of stars grew meant that the stars in the union tended to blur, affecting the appearance of the flag. Eventually Boat Flags with a reduced star count were employed, at first unofficially and then by regulation. These flags are highly prized because of their size. Most 19th century naval flags were quite large, naval boat flags provide a smaller alternative for both collectors and scholars alike. This Grouping presents example of these flags bearing 16, 13 and 48 stars. The earliest examples from the 1850 contain 16 stars. The design was standardized to 13 star during the Civil War and both of the variant star field designs are presented here. Several late 19th century examples of 13 star Boat Flags are also presented. The full complement of 48 stars was restored to Boat Flags in 1916, and a yard-made example from 1919 concludes the Grouping.